Eyelid surgery, or blepharoplasty, which removes excess skin of the upper eyelids and the bags under the eyes, goes a long way to make one look younger. Eye contact is a unique and important aspect of everyday personal communication, intimate conversations and business discussions. So in our daily interpersonal encounters, our eyes and surrounding mid-facial area often give the viewer an impression of one’s overall appearance. Changes in the eyelids usually are the first sign of aging, which includes skin excess of the upper eyelids, a skin excess and fullness of the lower eyelids and wrinkling of the skin lateral to the eye (crow’s-feet). Therefore, it is logical that one of the most frequent and earliest sought-after cosmetic procedure is eyelid surgery. 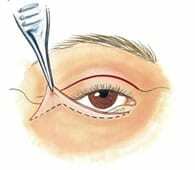 Also known as blepharoplasty (bleph meaning eyelid and plasty for the change the shape) or “eyelid lift”, this is a surgical procedure, usually done under local anesthesia with twilight sleep, to reverse these aging changes in one’s appearance. It is very effective surgery and is performed on both men and women. Due to the thinness and abundant blood supply of the eyelid skin, healing is relatively fast and scars are barely (if at all) visible. When indicated, incisions can be concealed within the eyelid. This surgery involves various approaches to the peri-orbital fat (puffiness) and depression or absence of fat along the rim of the eye socket. Fat removal, relocation, and transfer are techniques that can to rejuvenate of appearance of the eyelids. These images show the surgical process used to tighten the skin around the eye. Eyelid surgery is one of the most frequent cosmetic surgical procedures. However, it is important to select a surgeon that is qualified to perform this type of surgery. Several specialties overlap in this area. Some specialties are regional, such as Ear Nose and Throat (ENT) and Ophthalmology (eye), while board specialty of Plastic Surgery encompasses the entire body and face. ENT surgeons are certified by the American Board of Otolaryngology, and many have added training in facial cosmetic surgery. Ophthalmologists, both General and Oculo-plastic, are board certified (by the American Board of Ophthalmology) and restrict their surgery to the eyes and eyelids. Surgeons certified by the American Board of Plastic Surgery perform procedures on the face and all areas of the body, which can be a benefit when combined procedures are carried out under the same anesthetic. Board-certified Plastic Surgeons combine both cosmetic and reconstructive methods in their effort to improve and rejuvenate the appearance of the aging face. It is also important to accurately diagnose the cause of the cosmetic deformity. For example, the failure to diagnosis a true ptosis (eyelid droop or sleepy eye) or brow ptosis (low position of eyebrows) can result in disappointing results. Once again, one should seek consultation with a board certified surgeon.